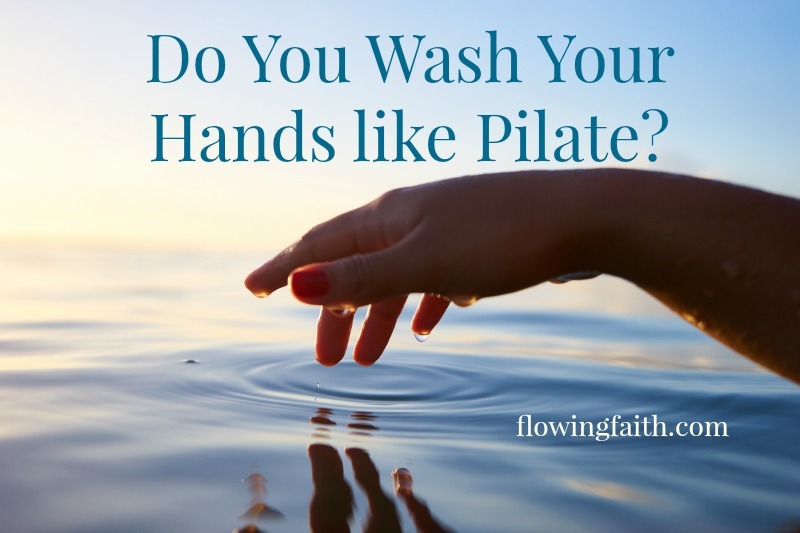 Do You Wash Your Hands like Pilate? Today, I was contemplating on the text on Pilate washing his hands for responsibility of Jesus’ death. I understand his dilemma: the crowd wanting Jesus dead and Pilate wanting to keep his job while (he and) his wife not finding Jesus guilty. What to do? Whom to serve? And did the hand washing work? Did he get rid of his guilt or not? How about you? How does that work? I’m afraid washing our hands do not take our responsibility away. Even if our heart hurts but we do or say nothing, we are guilty. Dietrich Bonhoeffer convicts us all with his words “Silence in the face of evil is itself evil: God will not hold us guiltless. Not to speak is to speak. Not to act is to act.” Are you guilty of trying to was your hands like Pilate, trying to serve many masters? Ouch. I am guilty as charged. What to do then? How to get rid of guilt? I hope you recognize that shame and guilt are two different things. Guilt is most often factual, based on the sins we’ve committed. God’s grace is the antidote to guilt. Because when we find forgiveness, we are finally free of guilt. On the other hand, shame is often fictional, based on feelings of inadequacy. God’s love is the antidote for shame. Because when we find our true worth in Christ, we learn to live as shame-free children of God. But back to Pilate. He thought it was enough to ritually wash his hands for responsibility of Jesus’ death. We might think it is enough to be neutral over the modern disputes. But we are as guilty as the crowd wanting to crucify Jesus. We can’t make ourselves good; we can’t save ourselves. But God can. Thankfully, Jesus chose to go to the cross to die for our sins. There’s no sin that grace – God’s aggressive forgiveness – could not win hands down. We can’t, but God can. Hallelujah! Forgive us for trying to make ourselves look good outside. Show us when we try to wash our hands like Pilate. no matter how insignificant it may seem to us. Show us your heart in the matters. Help us not to listen to the crowds. We want to serve only you, Lord. and help us to see others and ourselves with your eyes. heal what needs to be healed. Q4U: Do you wash your hands like Pilate? Does it work? How do you get rid of guilt & shame? Be blessed, my fellow pilgrim, as you embrace Christ and him crucified and celebrate the power of grace in your life! Image courtesy of Yoann Boyer/Unsplash, design by Mari-Anna Stålnacke. I am linking up with Unite the Bloggersphere and #tellhisstory.